Ingredients: Vegetables in variable proportions (Onions, Carrots, Rutabaga, Cauliflower, Marrows, Gherkins), Sugar, Malt Vinegar - from Barley, Spirit Vinegar, Salt, Chopped dates (with Rice Flour), Apples (with Preservative; Sulphur Dioxide), Modified Maize Starch, Tomato Paste, Colour; Sulphite Ammonia Caramel, Spices, Concentrated Lemon Juice, Onion Powder, Garlic Extract. SINGLE ( Individual portions, although you could share, if you HAD to ! ) PORTIONS plastic tub / dip pots of 23.5 grams nett weight each and approximately 24 grams gross (postal) weight. Branston Pickle by Crosse & Blackwell, is the UK's best-loved sweet pickle, with more than 28 million jars sold every year in the UK. 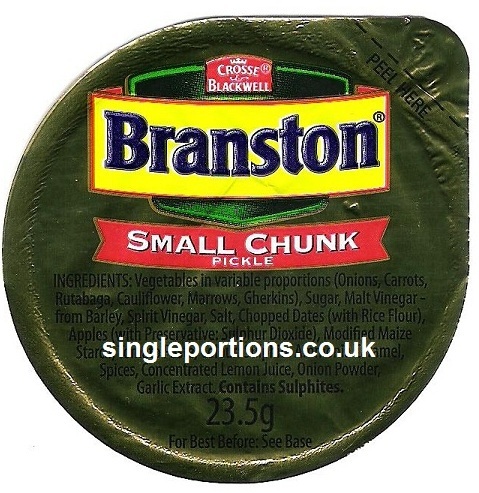 (in a population of about 61 million) Since its launch in 1922, Branston has been a firm family favourite. Today, Branston Pickle is still made to the same secret recipe and by the same traditional methods, blended to perfection for that unmistakable kick. The essence of Branston is its 'tang' which brings food to life through a unique combination of tanginess, sweetness, crunchiness and spiciness.